"The Doctor and his travelling companion, retired army officer Alistair Lethbridge-Stewart, take a random trip in the TARDIS - and land on the planet Skaro. The Doctor helped the Thals to defeat the Daleks years ago, so he is surprised to find the Thal city under Dalek occupation. He determines to help them again, but what is the Daleks' purpose in keeping the Thals alive? Does it have anything to do with the Daleks' mythical creator, named in their teachings as Davros?" What did you think? Was it weird seeing the non-Brigadier as a proper companion? Was it a good use of rewriting Dalek history? This was solid. 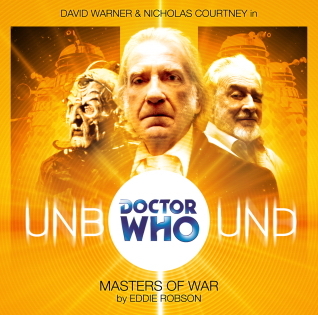 It was a fun listen and sort of gave a good twist to the story from "The Daleks." It was fun having the Brigadier in this one even with his character being changed up a bit. He's a fun addition and a good change of pace. The first Doctor did a fine job but he just didn't *feel* like the first doctor to me. It still worked though. This was a good story and every time the Brigadier spoke, I smiled, but I felt this was a missed opportunity. This Unbound series is supposed to explore a "What If..." that doesn't fit into the show's continuity. Since the history of the Daleks is so messed up and contradicting, I'm pretty sure they could easily craft a story about Darvos returning after being a missing teacher into a variety of different places. This seemed to waste the possibility of the What If..., especially because there wasn't enough Doctor/Brigadier moments. This was good but I expected more with the possibility.